The Cook County Land Bank is selling the Washington Park National Bank Building in Woodlawn, 6300 S. Cottage Grove Ave., after conducting public listening meetings to see what the community wants from the space. The Land Bank, a government entity that acquires and sells financially distressed properties, usually tax delinquents at scavenger sales, is seeking requests for proposals on the 35,000-square-foot site, and will choose a buyer based on their plans for development. According to the Land Bank, the public expressed a desire for retail shops, commercial offices, and medical facilities. The buyer will not be responsible for $3.7 million in unpaid taxes but will be accountable to the proposal they submit and subject to a redevelopment agreement with the Land Bank. Rob Rose, the Land Bank’s executive director, said the agency is “keenly aware” of concerns about gentrification in Woodlawn. He said the community’s “loud and clear” message was that they did not want a housing development on the site. 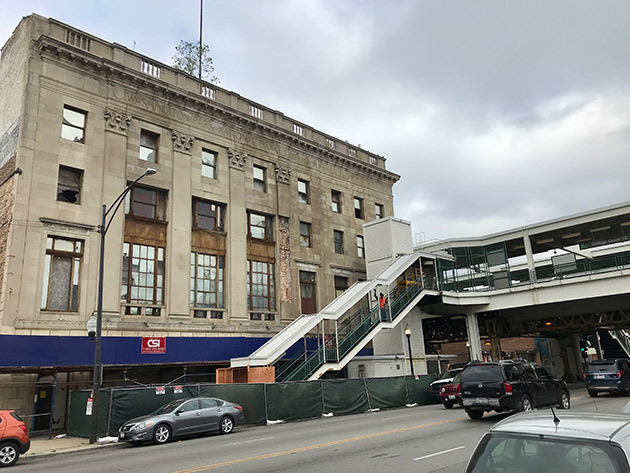 “They see this building as a destination,” Rose said, adding that the community wants greater pedestrianization of the intersection as well as connections with the nearby Coleman Branch of the Chicago Public Library, 731 E. 63rd St., and the terminus of the CTA Green Line’s Woodlawn Branch, which is due for a redesign. The development bids will be considered by a committee, on which a representative for the Woodlawn community will sit. Rose said that, while the Land Bank will consider proposals to take down the building, “our preference is for preservation.” The building was constructed in 1924 and clad in Indiana limestone. The Land Bank is an independent agency of the county government, with suburban mayors, real estate professionals and bankers on its board chaired by North Side County Commissioner Bridget Gainer. Rose said the Land Bank’s generation of its own revenue allows for flexibility in the communities it serves and nimbleness. The initial submission date for proposals is Oct. 1; Oct. 31 is the deadline, and the decision will be announced on Dec. 13.